You have a trip coming up and you are scared to death. Flying with kids can be really hard! How will you make it? 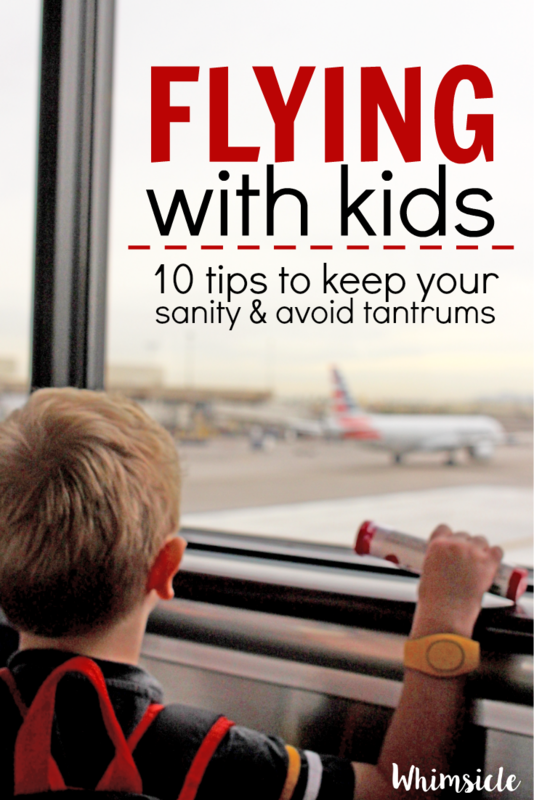 No worries, these 10 tips will have you on your way to avoiding temper tantrums at the gate and in the air. Pure Growth Organic provided me with compensation in exchange for this sponsored blog post. However, all the opinions expressed here are my own. First, relax about your upcoming trip. You are going on vacation!! Woot Woot! I know you are probably a little hesitant. Maybe you’ve never flown with your kids before or perhaps you have a three-year-old who is an expert at screaming. You might be reading a lot of blog posts right now that tell you to pack goodie bags for people around you or insist you don’t ask other people to hold your baby – I’m serious they’re out there. I’m not going to tell you any of that. Kids need to learn to fly and act appropriately in public. Your next trip is not going to be perfect. There may be a few meltdowns – it’s ok for you to have a mini-meltdown too. Here are a few ways to keep your flight and airport time as enjoyable as possible. This is my #1 rule when traveling. I don’t know about your family, but my kids get “hangrier” than anyone I’ve ever seen. 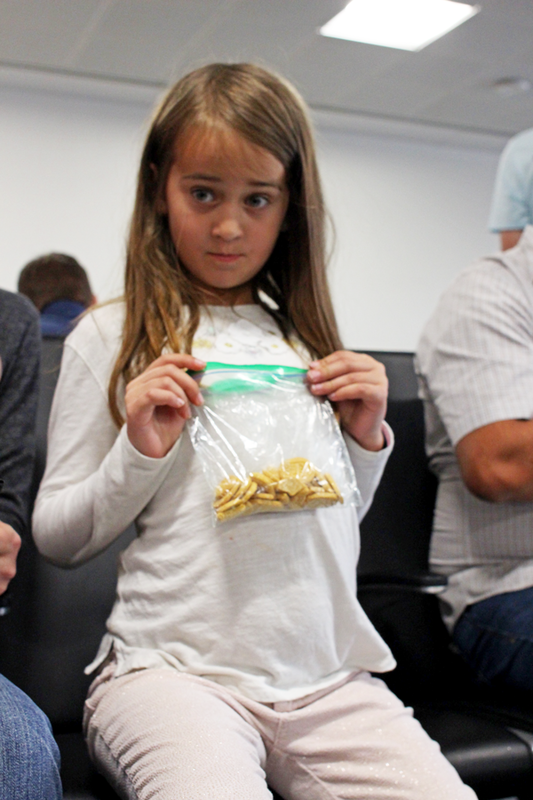 Look for pre-packaged snacks, oranges, bananas and other easy to eat munchies when flying with kids. 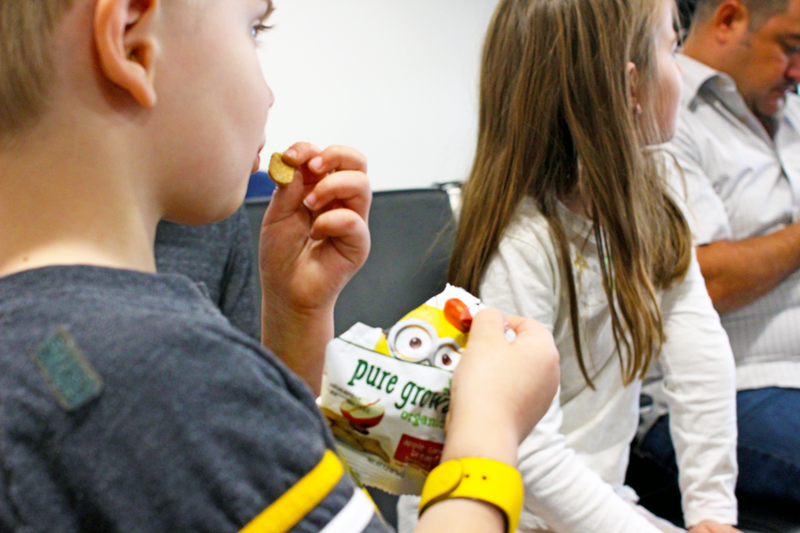 My kids are loving these Pure Growth Organic snacks. You can find these tasty and convenient snacks at your local Walmart. 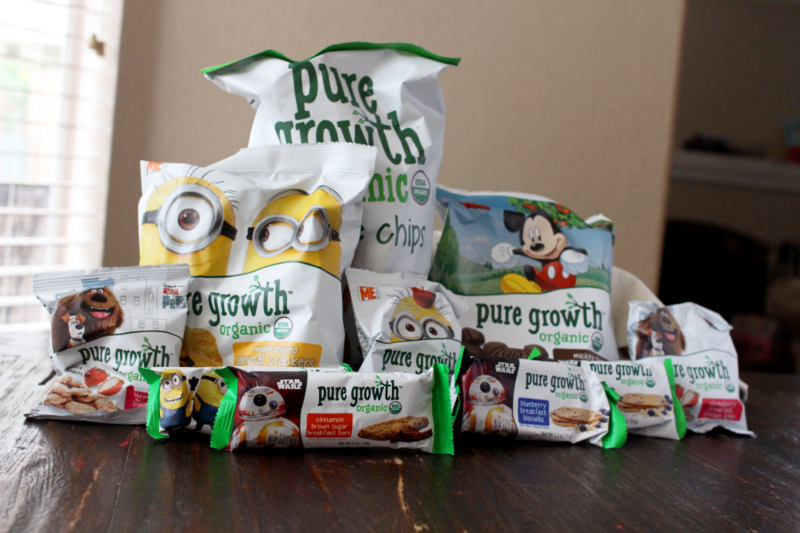 When Pure Growth Organic sent us this snack loot two weeks before our Disney World trip, I had to hide them from my kids. Both my daughter and son kept asking for the Minion shaped animal crackers and the blueberry breakfast biscuits. At the rate they wanted them, we wouldn’t have had any snacks left for our trip! Pssst… want a Pure Growth Organic pack like this?? Scroll to the bottom of this post and follow the instructions to win! Because of security screening procedures, you are not allowed to bring any open liquids over 3.4 ounces through screening. Baby bottles and medications are an exception to this. However, you are allowed to bring an empty water bottle. Once you pass security, find a water fountain. Most airports now have a larger fountain nearby where you can easily fill your bottle. No more thirsty kids and no more spending a bajillion dollars on bottled water by the gate. Ok… maybe not a bajillion. But $8 for bottled water? C’mon! Instead of you carrying all the kids’ activities, have your kids who are 3 and older carry their own. When helping them pack, choose items perfect for quiet play like coloring books, stickers, and tablets. I have a handy way to keep things organized in a kid travel activity kit here. Want kids to sleep on the plane? Your mission is to tire them out in the airport. Go exploring and ride everything! Ride the elevator, take a trip on the escalator, walk on those moving walkways, and ride the train between terminals. After riding, search for a great place to watch the planes take off and land. Then, go ride everything again. Kids have a way of being slow. If we’re frazzled, our kids can sense that and may respond by acting out. Give yourself tons of time. Know that everything will take longer than you plan. 6. Print boarding passes and check-in online. I love the internet! 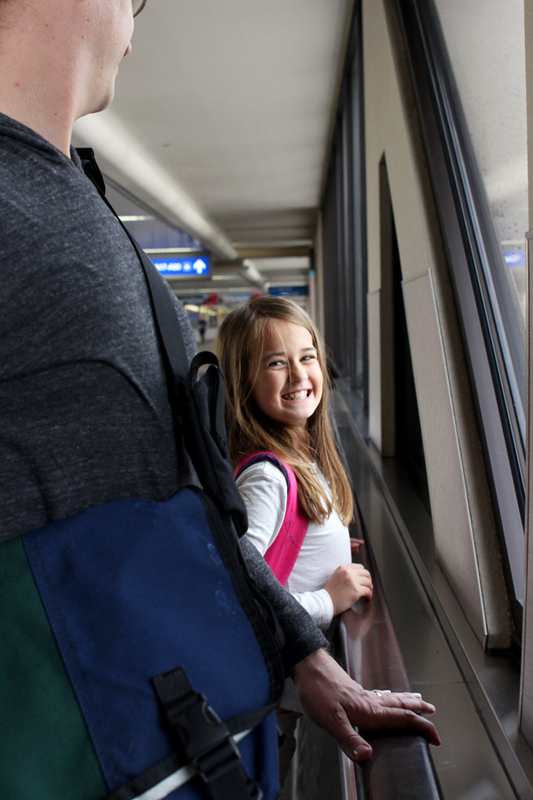 If your child is over 2, most airlines will let you check-in and pay for all of your baggage online. When you get to the airport, head straight to security, present your boarding pass and go straight through. The fewer lines that kids have to wait in, the better their mood. Security with kids is actually very easy. Kids don’t remove their shoes when going through the line (you still do). And you get one extra benefit. When you have a kid with you, you get to skip the body scanner. TSA agents will send you through the metal detector with your child instead. That means no awkward hands above your head pose. Score. 7. Know you might have priority security and boarding. If you are traveling with a child under 2, you will need a separate lap ticket for that child. These are free. Depending on the airline, you may need to check-in at the airport. This is so agents can see your child when issuing a ticket. Call the airline before your departure date to verify this. Now, here’s the good news. 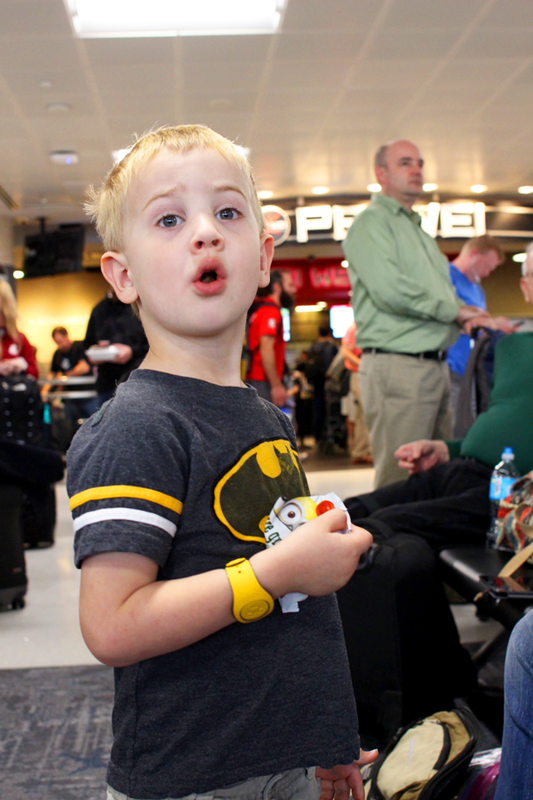 Most of the time, when you have a child under 2, your whole traveling party will get TSA pre-check. What this means is a shorter line at security and no one has to take off their shoes. Check your boarding pass for TSA precheck listed. Then, when at the airport, look for the TSA pre-check line and go there. 8. Keep some activities only for plane use. 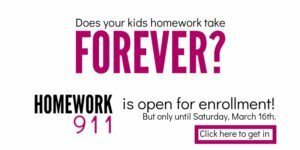 Young kids get bored if they don’t have an activity switch every 10 minutes. I recommend that you keep some items only for plane use. Perhaps save the tablet for the plane or keep a special coloring book and stickers for the flight. This past trip, I learned that large bags of snacks in your carry-on will force TSA agents to pull your bag from the X-ray scanner and do a manual search. Yes, my bag was the reason my family got held up at security. But, here’s how to avoid it. Package all snacks in a large gallon sized zip lock bag. Pack all snacks from larger bags into smaller single serving sizes – like I did with these Pure Growth Organic Minion shaped animal crackers. Before, your place your carry-on on the belt, remove that large bag and place it in its own bin. This way, your carry-on will stay packed and TSA agents will be able to easily identify the snacks and let you through. 10. Tantrums may happen – and it’s ok! Kids are kids. Traveling is full of new sights, noises and activity. They may get overstimulated and have a tantrum. My three-year-old son screamed while buckling in because he didn’t want to sit in his assigned seat and wanted to choose another seat on the plane. Some situations can’t be helped. For the next plane flight with your children, take a deep breath. By using these tips, you are doing everything possible to have a good flight. 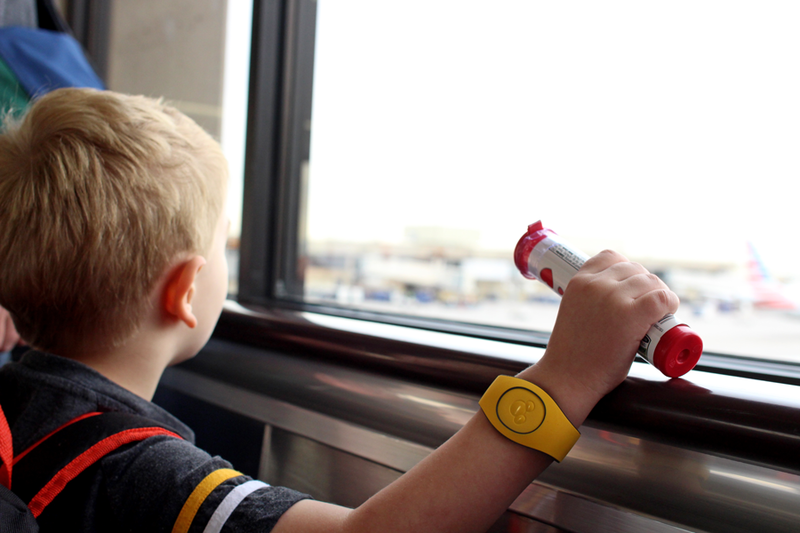 Take each tantrum one at a time and know that someday your child will be old enough to travel with ease. Until then, keep strong mama and pack those snacks! Remember, to go to my to enter to win a prize pack from Pure Growth Organic. In the meantime, go find them at your nearest Walmart.